This year I am aiming to be on the road for more than 10 months of the year. In that spirit I started my journey early and boarded a plane to Bali last December. Especially exciting I did not (and still don’t) have a return ticket to Europe. 24 hours later I arrived in Ubud, Bali’s cultural, arts and alternative center. My plan was to see where the wind takes me, learn from the nomad tribe about good locations. Also I want to stay in a region long enough to experience it more than just as a tourist. Also this is not one giant holiday but rather I will be working on a similar time schedule as back home. Of course my context will change. A lot. The first month went by so fast. I travelled to an island for christmas, a different town for new year’s eve and even got sick for a couple of days. 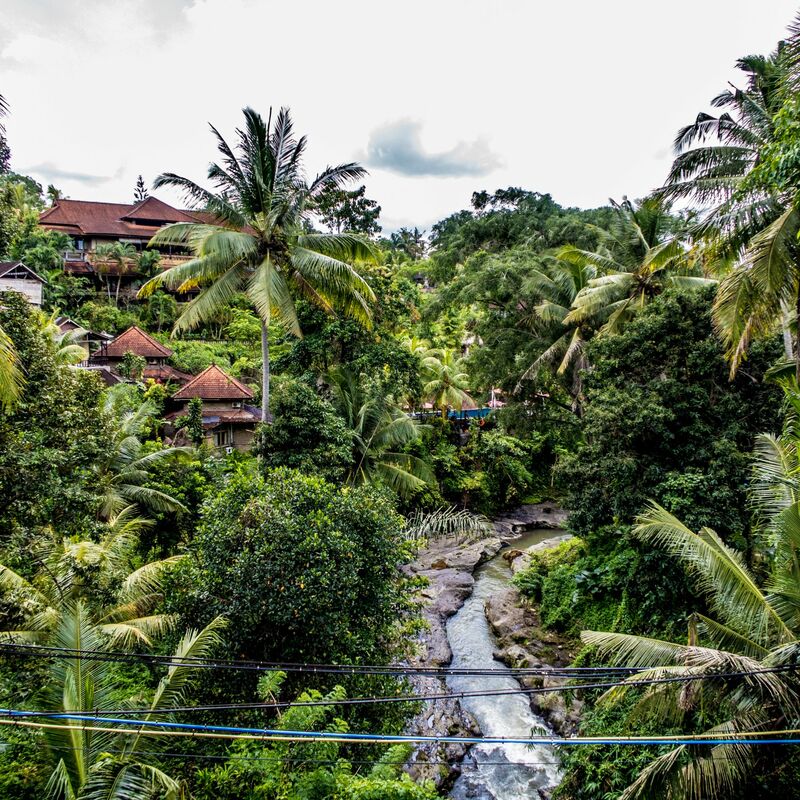 I had the feeling I didn’t get to experience Ubud as much as I’d like to. Then again it gives me a good reason to go back in the future. I moved to Sanur a couple of days ago where I will be spending my second month in Bali. So it’s time for a recap of the first month. I flew from Vienna via Amsterdam and Jakarta to Denpasar. Even though the journey was long I cannot remember a better cabin experience than this. Garuda is Indonesia’s national airline and wins awards for their service a lot. Drinks and snacks throughout the flight. My only wish would have been a seat that reclined a little more since I didn’t get as much sleep as I had hoped for. There was plenty of leg room. The airplane was a newer looking Boeing 777. On-board entertainment was a good selection of titles with Indonesian subtitles. No complaints about the food or drinks. Even though my international leg was delayed I boarded my second flight on time. Airport staff guide you through immigration, security (you have to change terminals) and towards the right gate. All in all a well oiled machine. Since this was my first time in Bali I opted to take a package deal that the coworking space Hubud offers. They take care transfer, accomodation, scooter, sim card and office space for a month. The full service comes in at 1300 USD (per month per person). This definitely makes it a luxury option for south east asia. But they also take care of everything and help you a lot during that first month. At the airport the driver waits for you with a bottle of water and drivers you about an hour to Ubud. The alternative is to navigate the hundreds of taxi and driver services. A typical mix of serious companies and tourist traps. At the hotel you’re greeted with a small welcome pack full of tips, a map and a sarong. The latter is important for visiting some of the religious places around Bali. Also included is a local sim card that pre-activated. I added it to my mobile wifi hotsport and everything was ready to go. Hubud offers a basic and a deluxe (300USD more) version of the package. I have to admit I had not done the appropriate research beforehand. So I had specific assumptions about what the accomodation should have been. I was expecting a room in a co-living accomodation. That is a typical villa shared between 4-8 other Hubud members. This is what I’ve seen as part of other packages. Having said that the hotel was allright. Everything worked, the staff were very friendly and the pool was clean. The included breakfast was average compared to other places in Ubud. The hotel was two categories of rooms. I was put in the back building which definitely needs some love and paint. A shower curtain would have been nice, but I would agree that it was basic as described. The basic accomodation is Putri Ayu Cottages. The deluxe is Pertiwi Resort I think. As a digital nomad you get used to focussing on Wifi and internet connection speeds. After all without it I can’t get work done. If you’re on holiday in Bali or don’t work online this might not be as important. Internet at the hotel was not stable or fast enough to work with. Git pulls worked more or less, but NPM updates required a lot takes. Sometimes an hour or more. Unfortunately 3G reception at the hotel was similary bad. On the road though 3G performance was fine and I navigated with Google maps without problems. Most places like coffee shops, restaurants or Warungs (traditional indonesian restaurants) have Wifi. These have varying stability and performance. The coworking space Hubud is definitely the place to go for work (see below) and has a stable and fast connection. They also have two redundant lines and a backup diesel generator for black outs. My experience working from coworking spaces is limited. But Hubud is definitely one of the best. Super friendly staff, a big space with A/C rooms and lot’s of community events. The entrance is easy to miss. Inside you can take a seat at one of the large desks for about 300 USD for the month. Again a high price point but in this case very worth it. Super friendly and helpful staff, streamlined registration and internet connectivity. They host a lot of events per week on different topics: skill sharing, social meetups and of course new member orientation. My tip would be to work from the non A/C rooms so you get accustomed to the humidity. These rooms have fans and when it rains there’s a beautiful breeze. The space itself is a bit dark at times, but you can always move the outside area. There you get to enjoy a rice field and lot’s of sun. Their in-house cafe is the living food lab. Delicious and healthy food at a prices comparable to what’s around the center. 30-60K IDR for a great lunch bowl. There are two other coworking spaces that I did not have the time to check-out. Outpost, which has a more “businessy” feel to it. And The Onion Collective where coworking is free but you pay for the drinks. Unfortunately I arrived before christmas and until new year Hubud is almost empty. About the second week of the new year the people working there tripled and there was a buzz around the place. Thanks to a flu I didn’t get to socialize with many of the great people there, but definitely a crowd you want to get to know. South east asia is Scooter territory. I had not ridden one before but there was one included for the month from Hubud so I gave it a go. In general you can get around Ubud center (comprised of two roads in a U-shape and the main road on top) on foot without a problem. This is in stark contrast to Canguu which I visited for new year’s eve and feared for my life walking the streets. Not because of the people. Everyone here is very friendly, respectful and a peaceful bunch. But driving here is very different to Europe. The roads are barely wide enough for two cars. Left and right there are large ditches for the rain to flow off. In rainy season the amout of water that comes down in a matter of minutes is unbelievable. In Ubud the drains are mostly covered. In Canguu they were mostly open. When faced with the option of being run over you perform some interesting acrobatics. Balancing your legs left and right of the drain while the water gushes between your feet. I did take out the Scooter to visit some of the sights around Ubud. It wasn’t that bad for my first scooter experience but still prefer not to if I don’t have to. You can book drivers to take you places at very cheap prices as an alternative. make sure your helmet doesn’t crush parts of your skull. This makes for a very unpleasant trip. If you stay longer consider even buying one that fits your head. avoid rush hour by getting out early (before 8). have a 100K IDR bank not in your international driver’s license in case you get pulled over. So far I haven’t but that seems to be the going rate for making issues go away. 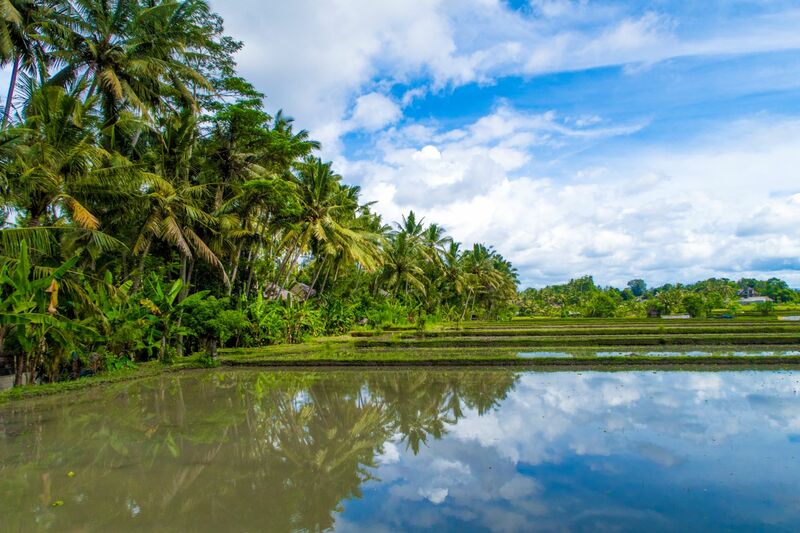 The easiest thing to do is take a walk through the rice fields surounding around Ubud. Go north up to and past a place called Terra Cotta. There on the left side you will see a small path. That path takes you down rice fields for about two hours. 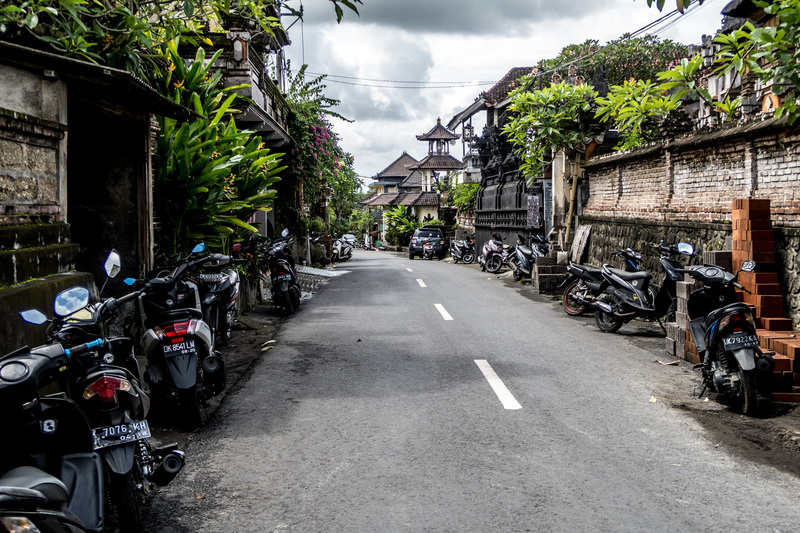 You end up on the south side of Ubud for a total walking time of about 4-5 hours. Take enough water. You won’t encouter anyone selling anything in the rice fields. One of the major attractions is monkey forest. My daily path from hotel to Hubud went past the forest and I saw monkeys almost every day. Inside the forest (40K entry fee) you see many more, can buy bananas to feed the monkeys. It’s a beautiful spot even without the monkeys. Definitely worth a visit. On the top of my list for things to visit was a rice terrace. The most beautiful in Bali are in Tegalalang. There’s no entry fee, but the farmers and owner expect a donation to pass through their fields. There are multiple “toll” gates. Each only expects about 10K IDR for a total of 50-60 IDR for spectacular views. 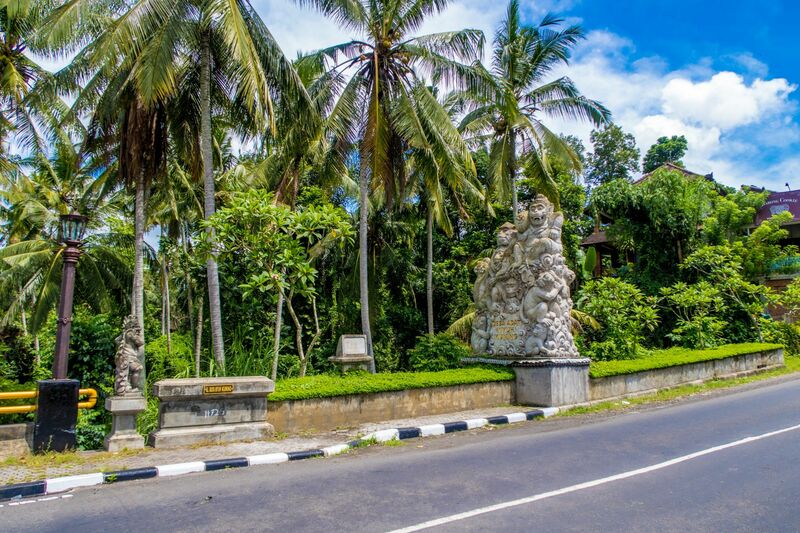 These are situated north of Ubud. It’s less than an hour by scooter. In the opposite direction lies Goa Gajah – the Elephant Cave. The hundreds of merchants will try to direct you to park in front of their stalls and sell you something. You need a sarong, which they will try to sell you, but you can borrow them at the entrance. One weekend I went to one of the three Gili islands. Gili Trawangan is the party island of the three. Still it has amazing beaches on the north and south side away from the tourist main road. Lot’s of backpackers, surfers and divers. Go snorkling with turtles or just enjoy amazing white coral beaches. Finally Canguu is about an hour drive by Uber (100K IDR) if you want to see the surfer hotspot. Ubud and Bali in general was a great place to start my voyage. It’s safe and fairly developed in terms of western services. But at the same time it’s still very asian and exotic so you’re thrown out of your comfort zone enough times. Hubud’s soft landing package certainly made it easy but it’s a lofty price to pay for comfort. If you plan on coming you can join the facebook group “Hubudians” or “Bali digital nomads”. About 1-2 times a week people advertise rooms or full places for sublet. You can get a good accomodation for a weeks or months at reasonable prices. Even if there’s nothing available that fits your dates exactly don’t worry. You can book something for 1-2 nights and once you’re on the groud finding things is much easier. 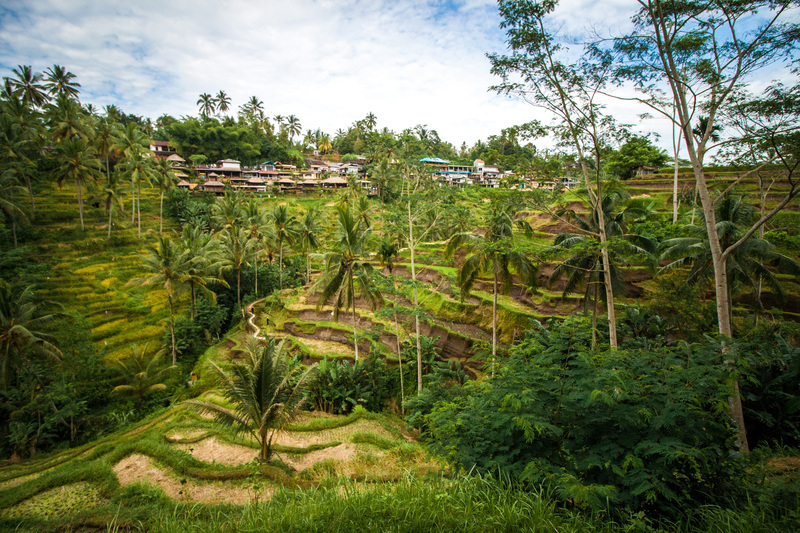 Ubud is definitely a great place for food, health and spirituality. The vibe is very special. I would have liked to explore some more so I will be returning – even if it’s just to experience Hubud again. Something I realized while in Ubud was that I wanted to be near the ocean. I’m not sure if this is a temporary fascination but for now I’m drawn to the big blue.